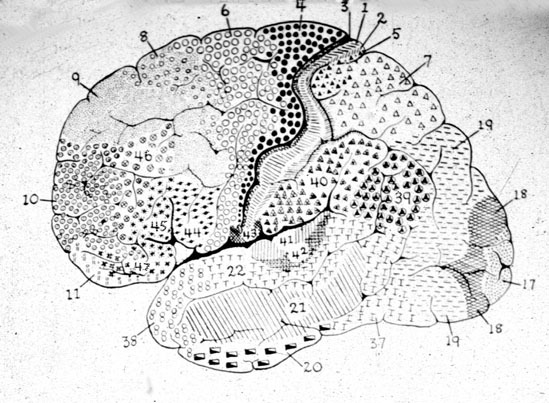 I promised quite a while ago that I’d write about the brain and the nature of consciousness. When I went to write this entry the first time it got so complicated I abandoned the attempt. This time I’m not going to make the same mistake. What I found is that if I write about this subject in depth I end up writing at least 100 pages worth of material, just scratching the surface. But I’m going to give an attempt to quickly graze over the surface of consciousness and the brain and hopefully you all will find it a little bit informative. Have you ever wondered if you’re truly free? Sure people say we have a “free will” to choose this or that, but can we choose what we like and don’t like? Can we choose who we fall in love with? Can we choose what we find beautiful? Can we choose what makes us happy? Interesting questions, wouldn’t you say? We feel we’re in control of what we say but where do the original ideas of words to speak come from in the first place? Sometimes when I’m out with friends I like to step out of my body and listen to myself talk, even though I always end up losing my concentration when I do so. People may find this strange, but I find myself thinking, “Are these my words? Listen to this machine, my body, speak. It just keeps talking.” Like when you come up with a witty remark. It just happens. Even Sigmund Freud said that if you try to think about wit, it loses its humor. Its something that just happens and you let it flow. Isn’t it interesting to think about the question, “Am I being honest with myself?” Sometimes I question whether it’s ok to give preference to a beautiful woman because of her looks. But If I denied liking cute girls, and acted like all I cared about was intellect and other factors, is that being honest with myself? Would I be in some sort of weird denial? So many questions like these are answered when you study neuroscience. You find out how the body sees things with the eyes, processes the forms, certain reproductive processes kick in, thoughts begin to flow, and then you see how you can inhibit certain thoughts in certain other areas of your brain based on your moral principles. The whole “being honest” and “not being honest” with yourself stuff really doesn’t capture the full picture. It’s more complicated than that. I used to have a weird question related to “being myself.” When I have to hold back what I really want to say, and have to keep myself from doing certain actions I really want to do, am I being myself, or is what I choose to inhibit myself from doing just as much a part of me as my desires? What is pain and why do we experience it? What is intelligence and how does the mind become aware of the world around us? What are the emotions and how do they work? Why do I wake up one day and feel down and out, then another day wake up in a giddy and full of life? Years ago I spent many hours reading philosophy books, and in them they would speculate about the nature of free will, whether animals were also conscious, how the mind organized and categorized information, what beauty is, what happiness is, the emotions and passions, and all sorts of questions like these. But most all of it was speculation and none of the arguments were conclusive. There was always arguing and different opinions that all seemed to lead in circles. But amazingly within our generation these questions are finally being answered! The answers are found within the subject of neuroscience! I can spend hours and hours reading neuroscience, and my degree of amazement and awe just never ceases. It’s like I’ve been this little soul trapped in this robot yet I never knew that specifications as to how the robot worked. Now I’ve been given this detailed manual telling all about every process of my body. Oh man is it fascinating! Stuff you would NEVER know about yourself. Take the fact that we have to two halves to our brains. We have a left half and a right half. Generally speaking, one side processes information for one side of the body and the other side processes information for the other side. I was reading a book written by a MIT professor on neuroscience and he started going into problems we have when we have brain tumors in various regions of the brain. 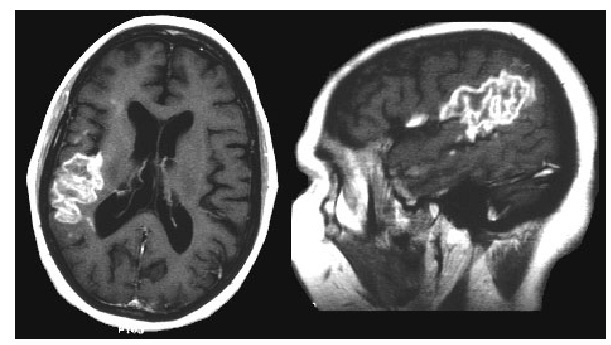 Here’s a MRI image of a patient who has a lesion in the left half of his brain. Now what sort of effects would a lesion of this sort have on a person? In this patient’s case he lost awareness of the entire right half of his body. He was asked to draw a picture of himself and he drew this. This man doesn’t know he has a right arm. He doesn’t know about his right leg. He’s completely lost consciousness of these parts of his body. Women who get this sort of disorder have problems when they put on make-up. They’ll apply make-up to one half of their face but not the other. It really is strange. You may go to the bookstore and buy some metaphysical book on “consciousness” and think that the subject is related to oneness with God and getting in touch with nature, or other such nonsense. That’s not what “consciousness” is at all. The real study of consciousness is this sort of thing. Now think about the consequences of what we just discussed. How can these people continue to see out of their eyes, yet not see something right in front of them? Strange indeed, if you don’t know how the brain works! This sort of disorder causes really strange things with memory as well. For example, you tell them to draw a familiar street in their hometown. They’ll remember everything on one side of the road, but can’t remember what was on the other. Then you tell them, “Ok, I want you to imagine going down the road a ways to the end. Now turn around. Tell me what you see.” Then they remember what’s on the other side of the road, but from a different angle. You’re probably thinking, “Man, that’s crazy.” I’m not 100% sure if I’m right on this, but I’m pretty sure that all of this has to do with our evolutionary origins. You see, if you trace our evolutionary lineage back far enough you see that way way back our eyes were on opposite sides of our heads, like fish. The two eyeballs saw totally different things, so naturally having one half of the brain process one half of the body, and the other half of the brain the other, makes perfect sense. But primates evolved in such a way that our eyes came to face forward instead of at our sides, yet at the same time we carry the baggage of our evolutionary past. This new evolutionary development was to help our monkey ancestors glide through the African trees and chase prey. It gave us a new sense of depth perception that we never had before. A creationist may have a lot of trouble accounting for this sort of thing, but if you believe in evolution it’s all very simple to understand. All of that stuff I just mentioned takes place within the outer 2 to 6 mm of the brain called the neocortex. Cortex comes from the Latin word for “bark”. Basically your brain is coated with a thin layer of neuron cells on the outermost surface, which is where all consciousness as you experience it takes place. Now the brain has all kinds of other features and functions. It processes information, calculates things, plans things, and so on. But your subjective awareness takes place in that outer “bark” of the brain. When electrical signals move through those neurons they seem to transmit information to your “conscious spirit” and you experience life. The rest of your body seems to be dead matter simply responding to stimuli and following the laws of physics. As for the cortex, we can apparently manipulate the signals within it in some way, which allows us what we call “free will”. Studying this is part of what drove me to studying quantum mechanics. I want to fully understand the nature of the atom and electricity, so I can see if I can model how these transmissions to the conscious spirit take place. This explains a ton of things for me. It explains why I can’t choose what I like. It explains why I can move my arm using free will, but if someone hooks me up in a laboratory somewhere and starts sending signals down my brain, they too can control my limbs using electrical pulses. In a very subtle way we can control ourselves by signal changes in the neocortex, yet we can easily lose control of ourselves at the same time. The old free will debates of the philosophers were too simple. Free will is a complicated merge with our physical bodies, not something ultimately simple. Now let’s try to discuss the brain a little more. I can’t discuss it in serious depth because that would take forever. If you’re really interested in this stuff buy some neuroscience textbooks and read it all for yourself. I will give you a basic rundown though. If you took out your brain and started cutting it up (you’d have to use some chemicals on it first, because in its native state its like cottage cheese), and then looked at each of these sections under a microscope, you’d see that the brain is not uniform. The cells that its made out of vary from one area to the next. The famous German neurologist Korbinian Brodmann (1868-1918) did just this. He cut up the brain into little thin slices, and then found where the cells changed from one area to the next. Each “area” of the brain he gave a number. These “areas” became known as Brodmann sections. Later we found out that each Brodmann area corresponds to a different mental function. Here’s a picture of one half of the brain with the Brodmann areas numbered. Before we discuss what some of these areas do, let’s discuss what I mean when I say that the brain cells are different one area to the next. Brain cells are called neurons, and neurons consist of central area with a nucleus, just like any other cell, but they also have these tentacle like arms which extend from them. One of these arms has a sheath around it, which links it to other cells, and its called an axon. The other arms are called dendrites. Now when you look at these neurons from each section you find that some area’s neurons have long dendrite arms, whereas others have short arms. Some have a ton of dendrites, whereas others have very few. Instead of trying to describe it to you, just take a look at this picture. Pretty cool huh? Just think, neuron cells of the outer “bark” of your brain have a special property that when electricity flows through them you have conscious perceptions of things. How cool is that! Now that we’ve introduce the subject, let’s give a brief overview of what various Brodmann areas do. Let’s start with vision, as that’s the most primary thing we use during our day to day lives. After light is focused through your eyeballs it hits cells in the back of your eyes which then transmit an electrical signal through your brain which finally makes it to areas 17, 18, and 19 (refer to picture above). Area 17 is raw sight perception. When I think of area 17 I think of a computer monitor. The computer, your body, processes and readies the signals and then finally the signal is sent to 17 and you “see”. The physical world is finally made into a conscious output. But area 17 alone is not all there is to sight. We see yet we’re also aware of what we see. Areas 18 and 19 process these same signals from the eyes and they analyze the contrast of color changes. From this we form concepts of motion, space, and the conscious awareness of “objects” around “us”. For example, if you get a brain tumor in areas 18 and 19, you’d still be able to see, but if I held an object up in front of you and asked you, “What am I holding?”, you wouldn’t be able to tell me. You wouldn’t be able to identify that I was holding a pencil. You’d see raw colors and nothing more. Those colors would not be processed into objects. How to explain areas 18 and 19. Well, I was out for a walk a few months ago during the winter and it was snowing. When I looked off into the distance I could see the snow coming down. I saw white flakes falling relative to the backdrop of the dark trees. But when I looked up into the sky the clouds and the snow flakes were the same color, so I could not see anything coming down. It’s like they ceased to exist. I just saw the clouds, which were just a whitish-gray mass of color. But once I turned my head back down, I once again saw the flakes and that they were falling toward the ground. My brain formed a conception of space and objects based on the changes and contrast of color. Object processing and spatial orientation happened in 18 and 19. Say you have brain damage to area 19. Weird things begin to happen. You may well lose your ability to notice motion. People with tumors in this area have trouble seeing changes in motion and time. One lady I read about had this problem. When she went to pour a cup of coffee she started to pour and then all of the sudden the cup was full. She had the hardest time knowing when the cup was full. It was an instant change with her. She didn’t see the liquid flow into the cup. Area 19’s processing of motion and change, based on color contrasts, was no longer working for her. She also couldn’t easily cross the street. Cars would seem far off in the distance. She’d go to cross the street and then all of the sudden the car would be right there about to smack her. It’s obvious that she requires assistance in order to function in this world. Otherwise she’s perfectly functional. She can talk with you, eat, feel, has emotions. She’s alive, but has lost consciousness of the motion of objects. Another interesting thing about areas 17, 18, and 19 comes from blind people. Say a person has a tumor which destroys area 17, but leaves everything else intact. The person becomes blind, yet in some weird ways is still able to see. These people do weird things. They’ll be walking around the room with a seeing eye dog and be heading for an object, but then they will just seem to “know” that it’s there and properly avoid it. Their brains are still aware of all the objects around them, but when they lose area 17 they seem to no longer “believe” that they can see or are aware of anything. For example, you set up an experiment where you flash a light bulb by pressing a button. You ask them to also press a button each time the light flashes. They’ll say, “How in the world can I do that when I’m blind?” Then you tell them, “Let’s just do it for kicks. We’ll see what happens.” They’ll correctly respond to the light flashes, pressing the button each time at the right moment 99.9% of the time. I suspect that time as we know it is partly an illusion of area 19’s construction. We have other association and processing areas as well, but I think time is somewhat of an illusion. That whole debate of whether we exist in the eternal present, or how time flows, I think all is done by certain areas of the brain like 19. Because it’s done by our brains, trying to use other areas of our brain which use language to describe the phenomena is completely useless. One famous physicist said that time is simply a given. Considering my neuroscience research, I think he’s right. But time is not just “out there”, but also flowing inside our brains. Time as we know it comes from our brains. Its a change in these objects which our brain processes, and changes in their states. Time and space “out there”, I’m not sure about. It seems to be more complicated than what our brains are telling us. If you have damage to any of the areas in your outer neocortex, whatever areas are damaged results in some loss of consciousness. Brodmann areas 1, 2, and 3 are the “somatosensory” areas. They control the sensations of touch, warmth, and other sensations of the body. They give you awareness of your limbs and feelings such as tingles. Brodmann area 4 is the primary motor cortex. Somehow your conscious spirit can communicate with this area and allows you to control bodily movement. It’s wired up in such a way that’s its connected to chain processes which when signals are fired here eventually give rise to bodily movements. This sort of research is why I need my lab. I need microscopes to look at brain cells. I need electronics equipment to stimulate these cells in various ways, and sensors around them to see if any sort of signals are fired off or radiated. I’m going to do research in quantum mechanics and study electrical flow in depth. This study of consciousness is one of my biggest areas of interest. Artificial intelligence and computer programming are all the same thing. My love of programming 3D graphics engines is part of why I love Brodmann areas 18 and 19. Those areas are what allow us to write computer games. We can make the monitor output different colors and your brains will process them into a 3D environment. Later I’d make artificial “neurons” like Brodmann area 4, and see if I could “mentally” and “telepathically” modify signals in those little circuits. If that were possible, the next step would be robots I could control like my own body! We’ve only just scratched the surface, but as you can see, studying neuroscience is a lot of fun. For now I’m going to have to end this entry as I’m getting pretty tired. We’ll have to continue this at another time. But before I go I’ll leave you with something very interesting. Many animals such as dogs and cats have neocortical areas just like we do. There’s good reason to believe that many animals are alive and conscious just as we are. If I recall correctly, dogs and cats have Brodmann areas where they feel sensations, and can control their movements. I think that’s very solid ground that they’re just as alive as we are, just not as smart. Frogs on the other hand, do not have these areas. They’re probably just lifeless matter hopping around. There’s a subject called comparative neurology, where different species brains are compared and analyzed. I haven’t had the chance to study that in any depth yet, but I certainly want to. When I went to pet my cat just the other day I was extra kind to her. Just as when someone grabs my arm I feel a sensation, she too feels it when you pet her back. Makes you feel sorry for stray animals who wander around the city scrounging for something to eat. Their conscious hunger is probably just as real as ours. Previous Previous post: What’s In Your Inbox?